Angry At Washington Gridlock? You May Want To Look In The Mirror : It's All Politics It's easy to blame politicians for failing to set aside differences and work together. But many political scientists believe that voters share the blame. Americans increasingly view the world through separate, partisan lenses and have turned compromise into a political liability. Like plenty of other voters, Tony Hocamp is disgusted by Washington. Too often, he says, politicians put their partisan interests ahead of doing what's right for the country. "The politicians we have in office right now are concerned about nothing but themselves and getting re-elected," says Hocamp, who runs a motel in Marengo, Iowa. It's easy to get upset during a political era in which the leaders of the two major parties seem incapable of putting aside their differences and working together to solve the nation's problems. But if there's plenty of blame to go around, some of it belongs to the voters themselves. They are the ones who have chosen the politicians. Quite often, they reward those who sit at either end of the ideological spectrum while punishing compromisers. In part, that's because voters are becoming more like rigid partisans — unwilling to see the other side as having any good ideas or political virtue. "The folks who've worked across party lines are generally being replaced," says Joe Hackney, the Democratic leader in the North Carolina House. "The public does ultimately hold the key to that." Recent polls underscore how much more polarized Americans have become. Public perception about whether the economy is getting better is increasingly divided along partisan lines. Over the past 50 years, the percentage of people who said they'd be upset if their children married someone from the other party has jumped to 40 percent from 5 percent. We live in an era when the choice of chicken sandwiches can become a political marker. In one widely noted poll last week, even people's beer preferences were shown to be predictable based on their partisan inclinations. Increasingly, Americans are going so far as to change their opinions about key issues in order to better match their partisan group, says Bill Bishop, co-editor of The Daily Yonder, which follows rural issues. "With issues as close to their heart as abortion and gay marriage, people are changing what they believe to stay with their [political] tribe," he says. Bishop commissioned a poll, which was released last week, that found people split along partisan lines when it came to their responses to immigration. Fair enough. But they split even more when informed that they were hearing the Republican or Democratic platform planks on the issue. In other words, just knowing the partisan label behind a position made people more likely to embrace or reject it. "If you ask people how they feel about the deficit or the DREAM Act, you'll find people are hovering around the middle," says Shanto Iyengar, a political scientist at Stanford University. "But over time, they have internalized the rhetoric they hear, that everyone on the other side is a total fill-in-the-blank." Iyengar co-authored a new study concluding that people's hostility to the "other" party has spiked in recent decades. There's an echo chamber effect to this. People are more likely to get their news from partisan news outlets and social media than they were a generation ago. And Americans are increasingly likely to live among people who share similar partisan leanings, says Bishop, who wrote a book called The Big Sort about this phenomenon. Back in 1976, only about one-fourth of Americans (26.8 percent) lived in landslide counties, which Bishop defines as giving the Democratic or Republican presidential candidates margins of 20 percentage points or higher. By 2008, nearly half of Americans lived in landslide counties (47.6 percent). Because Americans are able to shop around, in essence, for support for their own opinions through geography and media, they are now more polarized than Europeans — exactly the opposite of what was the case 30 years ago, says Torben Lütjen, a political scientist at the University of Dusseldorf in Germany. Lütjen is studying heavily Democratic Dane County and heavily Republican Waukesha County in Wisconsin, finding that people in these strongholds have completely separate and distinct worldviews and can't fathom their counterparts in the other place. "We all love compromise," Lütjen says. "Then again, we only love compromise that serves our own interests." 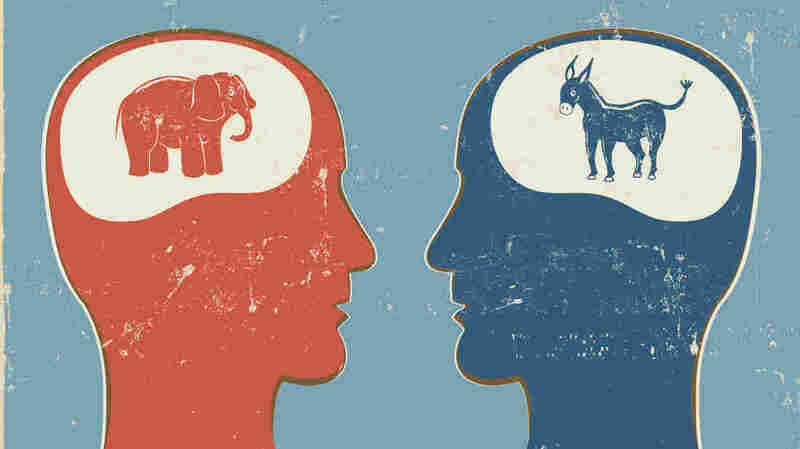 There are political scientists who believe that it's still mainly the political "elites" — officeholders and interest groups — who are heavily polarized. Average voters, they maintain, are not so ideologically divided. "The electorate has become more polarized, but not hugely so," says Jonathan Rauch, a guest scholar at the Brookings Institution. Voters are simply responding to the choices they're given by a political and primary system that is "essentially rigged to favor extremists," he says. "You cannot have moderate voters without moderate candidates." The number of voters who describe themselves as independent has been growing in recent years. Still, even they tend to hold strong partisan inclinations, says Elizabeth Theiss-Morse, a political scientist at the University of Nebraska. Many people, regardless of affiliation, subscribe to the mistaken belief that a big majority of Americans think the way they do, she says, and that it's only the intransigence of politicians that keeps them from doing the right thing. "As with bad breath, ideology is always what the other person has," as the British cultural critic Terry Eagleton once put it. The world looks different to voters in, say, Iowa City than it does to those in more rural Marengo, Iowa — or those in liberal Rhode Island, versus more conservative Texas. Rather than simply being a partisan universe of its own, Congress thus mirrors differences that exist among voters in the country. And those differences aren't likely to fade anytime soon, says Alan Abramowitz, author of the recent book The Polarized Public. Voters are increasingly divided by race, along cultural lines, on ideological grounds and by geography, says Abramowitz, who teaches political science at Emory University. "There's a very strong division among white voters that didn't used to exist or used to be very small, based on religious beliefs and practices," Abramowitz says. "For the people who care about them, on those issues, it's very hard to compromise."